It's a wonder to me that anyone even remembers Frank Sinatra -- "Old Blue Eyes." When I was a student I used to make money by ushering at a local movie theatre that specialized in old movies. Frank Sinatra featured in some of them ... but I don't really remember the plot. But he could sing and dance, and was generally charming, so I guess he was hot in his day. Apparently, he still has an audience. 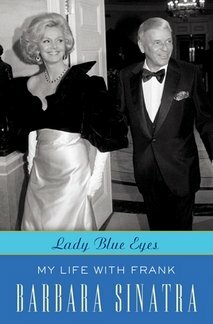 Douglass K. Daniel reviews a memoir by his widow, Barbara Sinatra, called Lady Blue Eyes: My Life with Frank (Crown Archetype), that is probably expected to do quite well. She was born Barbara Blakeley, and had a lust for the wild side. A twice-married model and showgirl, she met Sinatra when he was in his fifties. She fell for him. An affair commenced, along with all the glitz and glamor -- and demons. Sinatra, apparently, had a hair-trigger temper. It was part of his "dangerous" charm. One gets the impression that it paid to be happy to submit to his every whim. She smoked -- he didn't like it -- she quit (though he never gave up, himself). When he was drunk, she got out of the way.